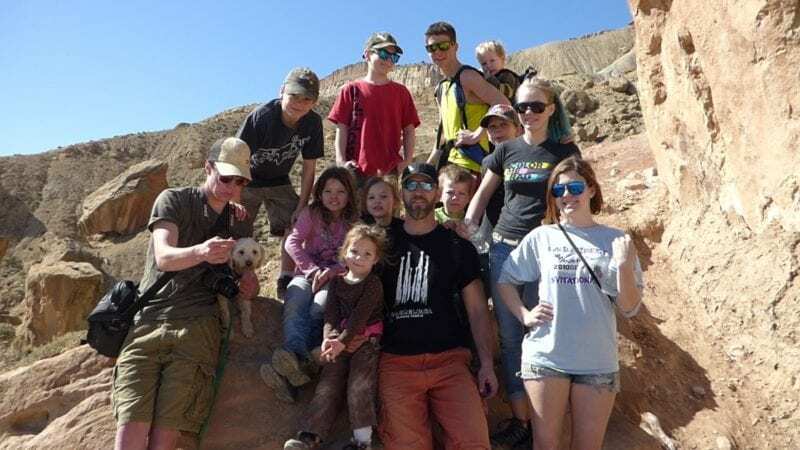 Hiking in Arches National Park with the whole family! Did you know that America is known as the Non-Vacation Nation? That Americans don’t really use all of their vacation days? Where Americans use 14, Europeans use, on average 30! This came as a complete shock to me, as someone who insists on living a vacation life and disconnects every opportunity I get, I simply cannot relate. But certainly, the fact that American workers can’t seem to put down their phones, laptops and tablets and disconnect, even if they’re sitting on a beach or on a cruise ship or on a family camping trip is a troublesome fact. And, it is a fact. Expedia.com conducts a yearly Vacation Depravation study across the globe and each year it shows some startling facts! Reading this survey got me thinking. Technology is a beautiful thing. It allows my husband, kids and I to live the truly epic life as a full-time traveling family. However, it does have a stronghold on our lives. 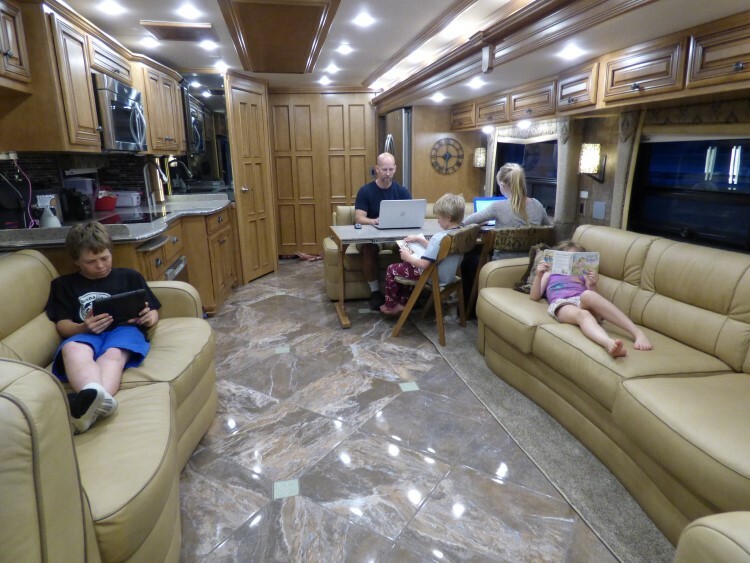 The “office” inside our Newmar Dutch Star! As a result, we’ve had to make adjustments to ensure that technology doesn’t get in the way of our lives and that my husband gets much needed breaks from the daily grind. I know it sounds crazy, but in a world where every hotel and every campground offers free wifi it’s hard to ever escape. Add the attachment to our phones and there is rarely a moment where we aren’t connected in one form or another! Notice, Brody, bottom left, on the phone in the family photo! Which is why it’s more important than ever to immerse our families in outdoor experiences that not only create great memories, but get us away from our work obsessed selves. Not to mention, getting our tech-obsessed kids outside, in the fresh air, doing all the wild things we did as kids! Here are 6 truly epic family vacation places to help your family escape the daily grind and focus on each other, having fun and making memories. Most of the time you can actually find wifi and stay connected via cell service, but you’ll be too busy during the day to try and too exhausted at the end of the day to care! Arches is probably the most spiritual place I’ve ever visited. I arrived a hot mess of anxiety and stress and I left completely rejuvenated. 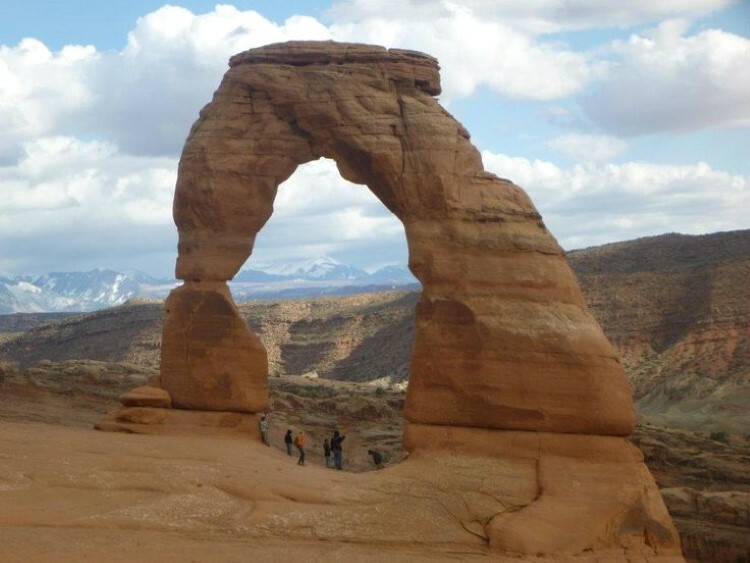 We spent 4 days exploring the park, hiking to some of the most amazing fins, arches and balancing rocks. The scenery was so stunning and the kids had a blast! There are ample trails suitable for even the youngest of kids, plenty of places to climb for all skill levels, and plenty of more difficult trails for more experienced and adventurous hikers. Hint: Hike up to Delicate Arch for the sunrise or the sunset, when the hues are a wild red … you’ll surely be awed. While we are hoping to explore the canyon on a river trip, we aren’t content to simply sit and wait the 25 years or so it takes to get a permit, or for one of our friends to get lucky. So, hiking the Grand is our second best, and what a grand second best it is! One must venture below the rim to experience the true beauty and magic of the Grand Canyon as well as to fully appreciate the historical, geological and natural wonders that the Grand Canyon is known for. History comes alive in the form of fossils and nature! The Grand Canyon with kids is a unique and incredible experience! Hint: There are many hikes suitable for kids of all ages, just be sure to talk to them about safety as there are several deaths each year from falls. 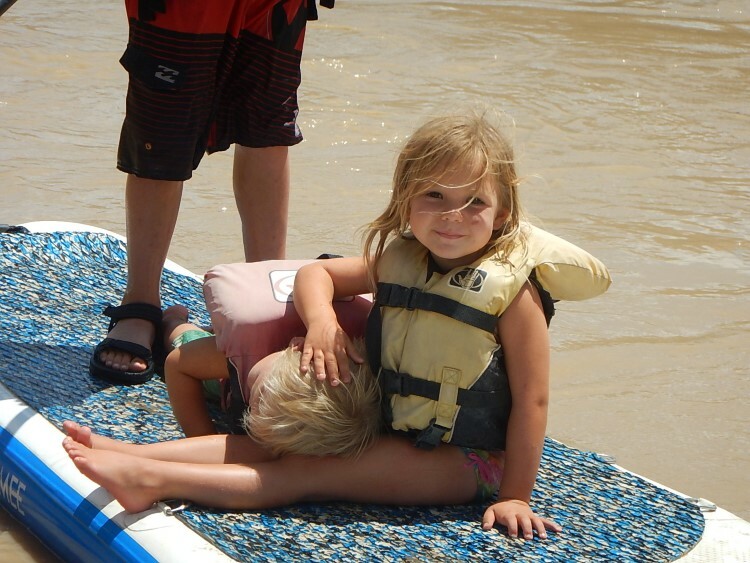 Such a relaxing float, Coby fell asleep on the Shaboomee SUP each day! It truly is a choose-your-own adventure in Colorado … from crazy class V’s to mild, family friendly, class II rapids, there is no shortage of river adventures in the wild west! The Ruby Horsethief stretch on the Colorado is the perfect opportunity to recharge your family, to enjoy nature and to get off the grid! A mild 26 mile class II float, means everyone in the family, regardless of age or ability, is able to join in the adventure. We camped two nights along the river’s edge in designated campgrounds and saw not one other person the entire trip. Hint: Black Rocks is probably the best campground on the stretch, not only for its beaches, but for its sheer beauty! Oh, and it is surprisingly free of those pesky mosquitos! RV’ing at the beach is really quite epic, especially in the off-season while the weather is still warm, but the crowds are non-existent. You have your home on wheels, complete with food, a kitchen, bathrooms, your own bed, climate control, etc., mere feet from the water! No making reservations or leaving the beach early in order to eat … you can maximize your beach time and your family time all while enjoying all the luxuries of home! Our Newmar Dutch Star makes for the most luxurious stay, better than any hotel for sure! Beach front real estate, falling asleep to the lull of the waves and watching the sun set over the water are just a few of the perks we enjoyed. 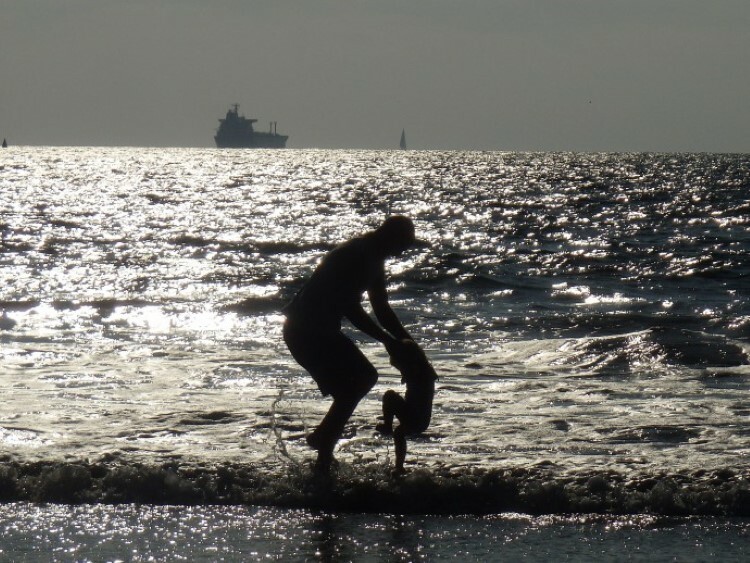 We also watched seals and dolphins, the kids went diving for crab, they snorkeled their first reef, we learned to surf, we kayaked in our Jackson Kayaks, we SUP’ed on our new Shaboomee SUP’s, made sand castles and played tackle football on the beach. Hint: Dockweiler State Beach was such an amazing (and comparably cheap) RV park on the sand, we had intended to only stay three days, but stretched our timeline to 3 weeks! I can honestly say I’ve never base jumped, ever. I can also say, it would take a hefty amount of money to entice me to do so, but if you are the base jumping type, you can do it and a ton of other wild and crazy things in Fayetteville. Fayetteville has two major things going for it that makes me rank it up there as a great place for a family to unwind. 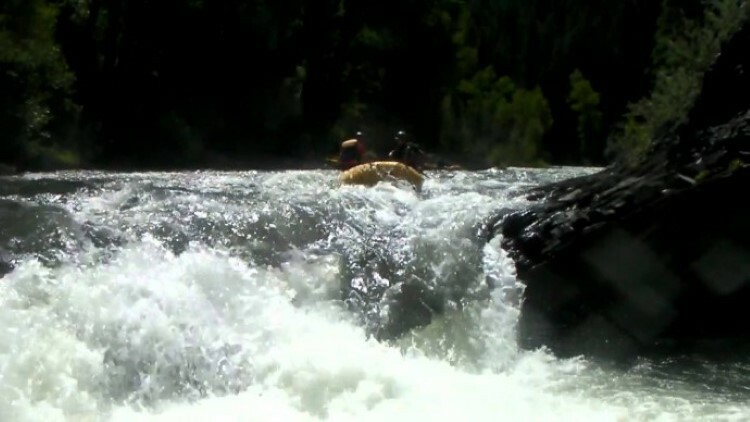 First, it’s got incredible whitewater. As a paddling enthusiast, I’m not sure much beats the Gauley River! Second, it’s got sick climbing routes, and I emphasize the plural in routes because there are literally hundreds! Hint: Fayetteville and the surrounding area is an adventurer’s dream, but if you are looking for something a little more chill, you can paddle the New River gorge, hike the Long Point Trail, bike the Arrowhead’s Trails or even hit up Summersville Lake for some flatwater to practice your SUP skills, fish, rent a boat, camp and about a million other things. I had to mention Aspen, or this list would not be complete as Aspen is a year-round destination. Choose from 4 ski resorts in the winter; and anything and everything else in the winter. Highlands Bowl has, undoubtedly, the best snowboarding terrain in the country … perhaps the world, which is why there is no mention of another ski area in this list! In the summer, road biking, hiking, paddling, and climbing all reign supreme in the temperate mountain climate! Hint: Aspen is really a one-stop destination, just be prepared to shell out some hard cash for the pleasure of vacationing in one of the hottest towns. If Aspen lodging is outside your budget, try down valley a little in Glenwood Springs, Colorado. It’s also chock-full of fun family things to do! Getting outside and having genuine fun will remind you what it was like to be young and carefree. It will make you appreciate your family just a little more and maybe, just maybe, rekindle a bit of that youthful exuberance we all should have for life. 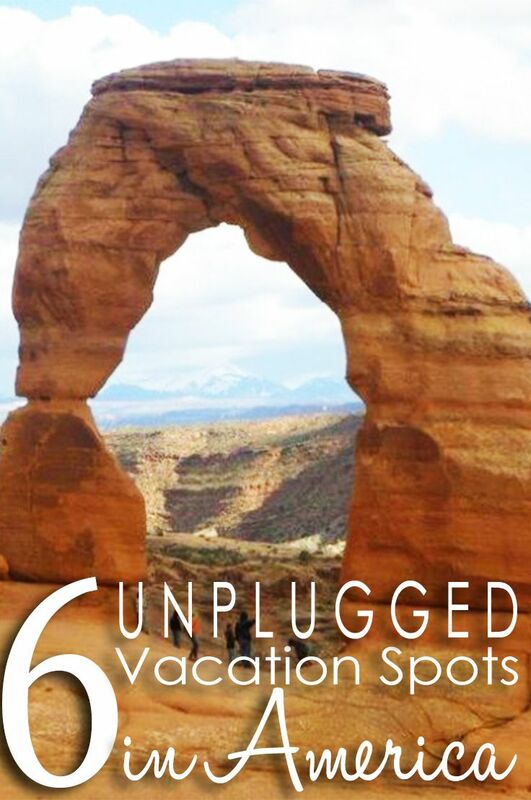 Where’s your family’s favorite spot for unplugged adventure? Share with us in the comment section below. Susie Kellogg is truly unstoppable as a traveling mom. She and her crazy husband, Dan, travel the continent full-time with their 12 kids in an RV. Her life is complete as she travels, writes, blogs, teaches and raises their 12 beautiful, faith-filled, fun-loving, crazy, adventurous kids. 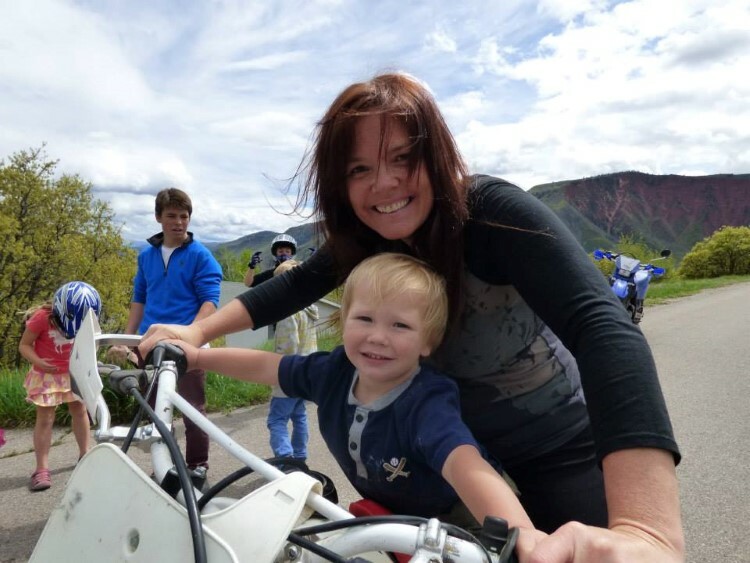 Susie and her family are adrenaline junkies and love extreme sports -- whitewater kayaking, rafting, snowboarding, surfing, and SUPing, to name a few. 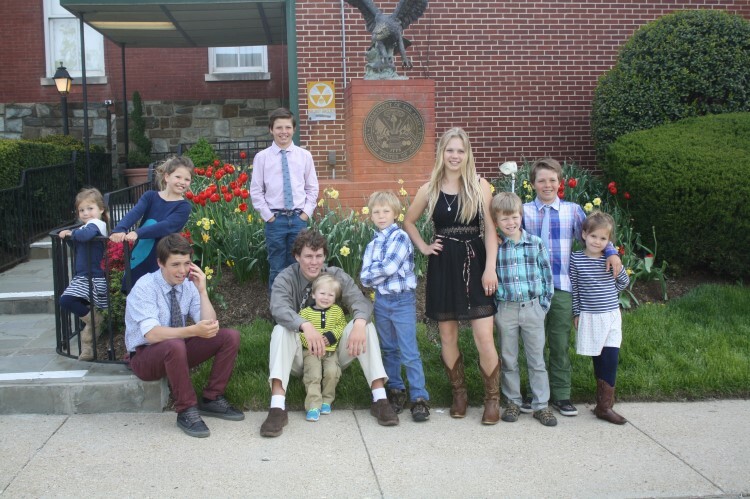 As a family, they are sponsored by Jackson Kayak and Kokatat Watersports Wear and her kids compete at the highest levels of the sport, racking up awards as well as their own sponsors. Susie and her family have appeared on the Today Show, Fox News, Sunrise at 7 and have been featured in dozens of magazine and newspaper articles. Nick News produced a 30 minute episode on their family, titled “12 for the Road”. 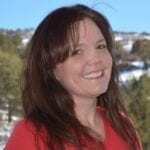 Susie is the author of “Raising a Badass Family” and blogs at kelloggshow.com.